Have you been getting the same unadventurous trim at the barber’s for several years and feel like you’re stuck in a bit of a tonsorial rut? Don’t worry, you aren’t alone. For men who aren’t into following the latest hair trends it can be all too easy to settle on a basic style and wear it to boredom and beyond. The solution: up your game by selecting a new classic cut that’ll revamp your look but won’t leave you cringing at old photographs 10 years down the line. These are the classic men’s hairstyles you need to know, and why you should consider them for yourself. As far as haircuts go, very few (if any) boast the simplicity of the buzz cut. This military hairstyle has been around for as long as there have been hair clippers and has the added benefit that, with a little practise, it can be performed at home. The hair is taken down to the same length all over using a set of clippers. Typically, this will be anywhere from a grade 0 to a grade 4. Any longer and you’re into fluffy tennis ball territory. Which, for a style-conscious gent, is never a good place to find oneself. Due to its low-maintenance style, the buzz cut is best suited to busy men who don’t want to spend 20 minutes blow-drying and sculpting their locks to perfection every morning. This is a jump-out-the-shower-and-go cut, making it ideal for time-poor guys. In terms of matching to your face shape, it’s best to steer clear of you have a very round face. Other than that, you’re good to go. Another classic with its roots planted firmly in the armed forces is the crew cut. At its core, the crew cut is what your local back-alley barber might refer to as a “short back and sides”. A solid option for men who are looking for something easy to style and maintain, but aren’t quite prepared to go for a full buzz cut. The hair is taken down very short on the sides and around the back of the head. Moving up, it graduates into slightly longer hair on top. The front of the hair is often left slightly longer still and swept back into a neat, extra-short quiff. As mentioned, this style would be perfect for men who are put off by the harshness of a buzz cut, yet still seek a style that is easy to maintain. With nothing more than a small amount of product each morning and a monthly trip to the barber for a touch up, the crew cut is one of the most fuss-free styles there is. Face shape-wise, the crew cut is what we like to call an all-rounder. The length on top will help to draw out rounder faces while the lack of any real height will avoid over-elongating longer face types. It’s one of the most popular trims out there, but it’s by no means a boring choice. The French crop is another shorter style that keeps things tidy in the back and sides with a little more room for manoeuvre on top. Often confused with a Caesar cut, the main difference here is the fringe, which is left noticeably longer. Over the years, it’s been chopped, changed and brought up to date, and is now often combined with an undercut or a taper fade to keep things clean and contemporary. The French Crop is a solid all-rounder: not too long, not too short. It’s a relatively low maintenance, too, but still requires a bit work to style right. Overall, it is a good option for men who are looking for something timeless and stylish, and don’t mind spending 5-10 minutes each morning to ensure it looks its best. It’s also a versatile choice in terms of matching face shapes. Whether your head is rounder than a beach ball or as square as square can be, the French Crop will complement it. Dreadlocks don’t always have to be the waist-length versions favoured by seasoned Rastafarians. In fact, when worn a little shorter they make for a sharp, timeless style for anyone with afro hair. This contemporary option has been rocked to glorious effect by everyone from world-leading musicians to A-list movie stars, so if you decide to take it on for yourself, rest assured you’re in good company. While some will swear blind that the dreadlocks can be formed at home, if you want them to look smart and uniform, you’d be well advised to seek out the help of a professional. 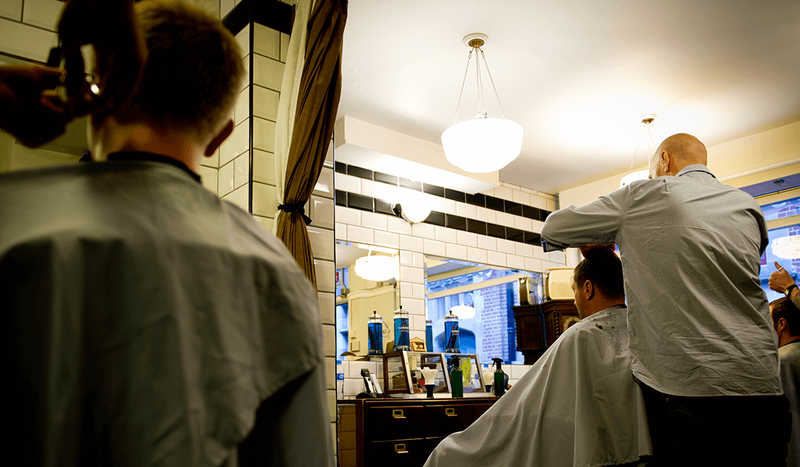 There are a number of specialist barbers around the UK who can guide you in your quest, so before you bust out the toothpaste and have a go yourself, you’d be best off popping in for a chat. Once the dreads have been formed, this is a relatively easy style to maintain. However, it’s most commonly worn today with an undercut, in which case you’ll need to be making fortnightly visits to the barber to keep things sharp and in shape. The added length on top means this is a good style for those with round, oval, square or heart-shaped faces. But if your face is more rectangular you may want to think about going for something shorter like a buzz cut instead. Timothee Chalamet, Dev Patel and Justin Bieber all had a part to play in making mid-length locks one of this year’s biggest hair trends. And it doesn’t look set to fall out of favour anytime soon. That’s because as well as being one of the hottest haircuts of the moment, loose, mid-length hair is a time-tested classic. A great option for those who don’t want things so clean cut. In short (no pun intended), this longer style is best suited to men who aren’t averse to a bit of maintenance. Granted, you won’t have to style it with heaps of hair products and go for touch ups every five minutes to keep your fade from, well, fading. However, longer hair brings with it fresh problems like split ends and greasiness. So if you want to keep it looking good and glossy, you’ll need to tailor your grooming routine accordingly and invest in a high-quality shampoo and conditioner. When it comes to face shape this style works for most. The length at the back and sides will frame the face and complement it, whether it be round, square, rectangular or anything else in between.